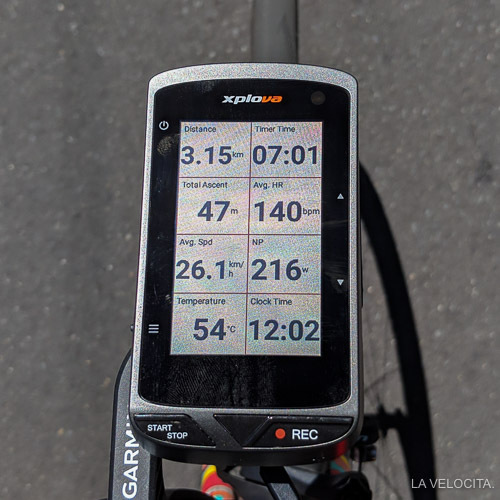 Xplova X5 Evo GPS review - LA VELOCITA. The Xplova X5 Evo is a strange beast. It’s made by a subsidiary of Acer, powered by an Android operating system, sports a forward-facing stills and video camera, and will liberate you of $599 Australian Dollarydoos to buy. I’ve been on something of a cycling GPS rampage over the last 18 months; using and reviewing a bundle of them. I can safely say the Xplova X5 Evo is the oddest, and most challenging unit to review by a wide margin. None of the others pushed the boundaries like the X5 Evo. So, does it manage to give a genuine alternative to the industry’s heavy hitters? Alright, let’s do it! The Xplova X5 Evo won’t be winning any beauty contests with its bulges, bumps and odd lines. Its case size to screen size ratio isn’t great either. There’s some hidden hardware riches in the homely packaging though. It’s certainly an odd-looking unit in a market that’s getting more svelte and clean. I like the buttons for a start. They’re chunky, solid-feeling and have a satisfying click to them. You’ll never hit the wrong one either because they’re spaced far apart, all around the unit. The rear houses the micro USB charge port beneath a chunky rubber door and the mount interface set on the bottom half of the case. The star of the hardware is the 240x400 px touch screen. I crowned the Garmin Edge 1030 as the best GPS touch screen I’ve used only a few months ago. That feels silly now because the Xplova X5 Evo is substantially better. It’s wandering closer to smartphone quality touch screen than any unit I’ve used before. Responsiveness is very impressive as you only need a light touch to switch between screens and navigate the menus. The X5 Evo also responds to pinching for zooming in and out too which makes map navigation and route creation much easier. I want to laud the sheer speediness of the unit. There’s a lot of processing power in this thing. There’s no lag after touching, maps load almost instantly, and activities are saved and processed straight away. You can even record video, with the live capture screen displaying at the top of the screen, while scrolling around the map at the bottom of the sreen and it’s only slightly slower than without the camera operating at all. Impressive stuff. While hardware isn’t pretty to look at, I sure did like using the thing. I got sent 2 Xplova out-front mounts to use with the X5 Evo, both of which has a bad case of the wobbles (one being noticeably worse than the other). It’s not rigid enough and shakes visibly when riding. It’s an especially big problem for a unit with a camera because it directly affects the footage. Garmin’s quarter-turn mount system is a welcome choice. There’s good news though... wait for it… the Xplova fits all Garmin quarter-turn mounts. Hallelujah! Juggling mounts has been a bugbear for me as I’ve had so many units come through in the last 2 years. Lezyne and Giant use their own proprietary systems and Wahoo use the Garmin quarter-turn but rotated at 90 degrees. To have all my favourite mounts available for the Xplova was brilliant. 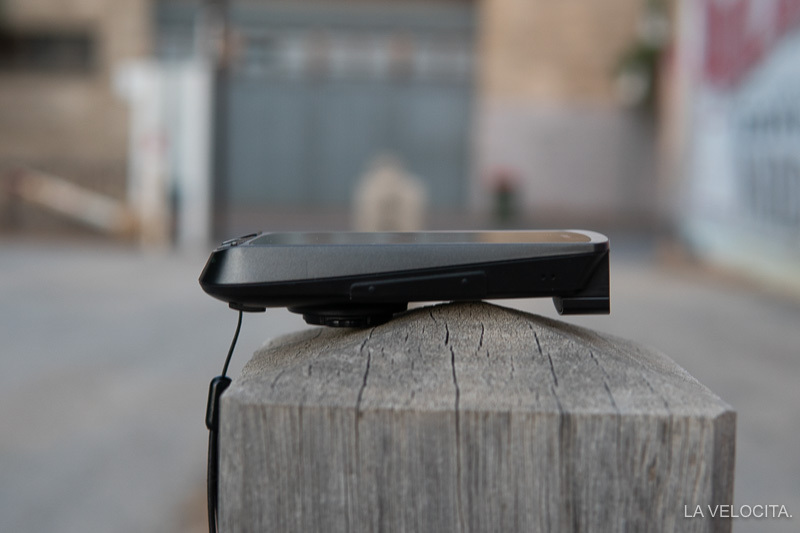 A proprietary mounting system could have been disastrous for the X5 Evo because it affects the camera so much. The Xplova mount doesn’t cut the mustard but there’s a world of compatible mounts out there. Anyone wanting to use the camera will need a better mount. The footage captured from my Garmin mount, and all-metal Tune Porteur was significantly better because of added rigidity. The Xplova was quite easy and quick to set up. Its altered Android skin and the responsive touch screen made tapping through the menus easy. There’s a hilariously small keyboard that crams into the bottom third of the screen when you need to type numbers and text in. Type carefully because it’s very easy to make mistakes. Nonetheless, it didn’t take me long to enter my basic personal data, connect to my phone via hotspot, and download the most recent firmware. The default starting screen shows a panel of 6 options; the top 4 are direct access to routes, previous activities, training and workout plans, and the video controls/storage. There’s a big green Ride button at the bottom with an in-set cog for changing the settings built into it. Having the two most used buttons built into each other is an odd choice. Menu tiers don’t run too deep, and most things are intuitively listed and place where you’d expect. There are some exceptions and I did find some options after several weeks with the unit I’d never seen before hidden in odd spots. Scrolling and tapping is smooth and quick thanks to the excellent screen and processing power. It didn’t take long until unit settings were how I like them. There’s a cool dashboard display locked into screen one position number one with options called Default, Automobile, and Fitness Bike. They’re all variations of the same data set; speed, heart rate, power, cadence, power, time, distance, and elevation. I like the screens but you can’t change the fields. So riders without sensors are stuck with dead fields. C’mon Xplova let us change the dashboards! You can turn the dashboard off if you like it though. The dashboard is very cool, but limited by being unchangeable. Next are the user-defined paged. They’re stored and edited under the Bike mode menu where you can activate and deactivate 4 data screens and 3 map screens. You change data pages by choosing a layout but are limited to; 3, 5, 7, 8, 9, and 11. I never realised how much I love 4-data field pages before I couldn’t have them. I found the list of data options consistent with basically every other unit I’ve used with all the standard movement, speed, power, time options available. The one exception is 10 second average power. You can choose only 3 and 30 second average power. I like to use 10 seconds for better smoothing during efforts than 3 and more current detail than 30, but that’s a personal choice. You can change data fields before you ride, or easily while riding by holding your finger down and scrolling through the menu to find what you want. There’s options for graph displays that are fun for metrics like heart rate and power. They scroll constantly on a 30 second x-axis so you’re seeing recent data. I’ve used graph displays before and thought they were a bit naff. These are more interesting because of how they constantly scroll. You can see spikes and troughs of power and speed as you ride. It’s a strictly “nice to have” feature though because my focus was mostly the regular data pages. My one small gripe with Xplova’s management of data pages a is how they’re tied tied to Bike Modes; Road, Off-Road, Leisure ride, Indoor etc rather than your set bike profiles. I run multiple road bikes with different sensors so I’d have to set different Bike Modes - “Leisure” or “Training” for example - to match my data page choices and then switch between Bike profiles to have it connect to the sensors I use. I’d like my data pages and sensors tied to my Bike profiles so I can more easily switch between and remember what each one is. Xplova has made a companion phone app and browser-based platform. The Xplova Connect app works just fine; tracking your activities, letting you create routes and then send them to your device, and housing structured workouts you can use. Connect it to Strava and it’ll automatically shoot activities across. It can’t be used to set up or alter the device like Lezyne or Wahoo’s apps but it’s a functional bridge to your device and connected services. The Xplova website is basic but easy to use. You can sync from phone app to website and vice-versa in the confusing named “Extended Function” menu item on the head unit. Like similar platform offerings from most GPS makers, I don’t see the Xplova’s website challenging established giants like Strava or TrainingPeaks. The Xplova X5 Evo connected to all Ant+ sensors and a recent update made it Bluetooth compatible too. I connected everything without issue through the Bike Profiles section (heart rate monitor, Stages Power Meter, cadence, and speed sensors) and everything stayed connected without issue while riding. I only have Ant+ sensors though so I can’t comment on the Bluetooth effectiveness. The aforementioned phone Wifi hotspot connectivity is another unusual decision but one that’s very necessary. Wifi hotspot allows much faster transferring than Bluetooth which is critical for beaming video files from Xplova to phone. It makes uploading rides and syncing with the Xplova a little annoying because you have to disconnect from WiFi networks. Annoyance aside, it’s a reliable and very fast connection with none of the Bluetooth nonsense that I’ve found with some GPS devices. Syncing a ride from device to phone takes a couple of seconds, and minute-long videos transfer in roughly 1.5 minutes. It’s impressive really. Maps on the Xplova X5 are brilliant and completely free because it uses open license platform OpenStreetMap. Navigate through the menu and you’ll find the Download Maps section where you can find maps from around the world for free. They’re broken down into regions, then countries/provinces. Europe, Asia, Russia, South America, Central America, North America, and Australia/Oceania appear to have most countries available. There’s not many African countries, and some of the Middle-East is available under the Asian menu so it’s not the entire world. I love that Xplova have made so much of the world available for free download. The map display is excellent too with street names, parks, suburbs, and major roads all marked. There’s +/- buttons to zoom in and out, a button that centres the map on your position, and a free scrolling option so you can pinch, and slide your way around the map. You can add data fields to the bottom of the map screen, which I did, to track stats while seeing where you’re going. It’s a fantastic map system and one that erodes Garmin’s navigational primacy. Maps are detailed, and scrolling through them is speedy. There’s 3 ways to get routes on the Xplova; the Xplova in-browser platform, Xplova app, and connecting to your Strava account. Creating routes in-browser is clunky and involved placing your waypoints very close together. The system isn’t well optimised for cycling so you can get some terrible suggestions between waypoints. It’s quite laggy too so I didn’t use it more than a couple of times. 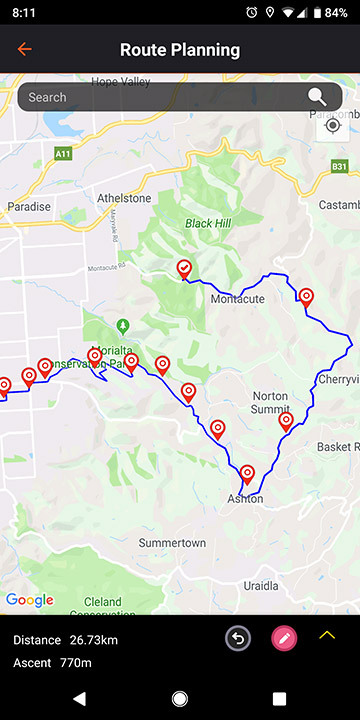 Phone app route creation is much smoother with the touch screen allowing me to knock together routes quickly and transfer them straight to the device with the WiFi hotspot connection. Easy peasy. Having access to my Strava routes is brilliant too because that’s my route designing platform of choice so I can choose it from the menu on the Xplova. Fire up a route and the Xplova won’t ask if you want to be led to the start. I’m cool with that because I hate that feature on every GPS I’ve tried it on. Every unit I’ve tried it with gives terrible routes, freak out when you ignore them, and shriek constantly while recalculating. The Xplova X5 just gives you a whopping big yellow arrow that points from where you are to where the route begins. That’s all, and that’s plenty. On-route the map shows a thick blue line for you to follow and a red line to show where you’ve been. It’s definitely one of the less obtrusive systems compared to the interruption-heavy competitor units. There’s some directions written on the map screen in tiny text for the eagle-eyed but it doesn’t interrupt or overlay direction when you’re on data screens. Instead it emits a quiet chirp to let you know a turn is coming. I like its subtlety but it could be easy to wander off course if you’re not paying close enough attention. It doesn’t hold your hand like a Garmin or Lezyne will. One of the Xplova’s biggest talking points is the 120 degree angle, forward facing camera in the front edge of the unit. I like the idea of integrating a camera into a GPS and there’s real potential in it, but execution is a little lacking. Buyers can get value out of the camera if used in the right context and with the right expectations of what it can do. It’s an easy camera to operate in manual recording mode; give the Record button a poke and the top third of the Xplova screen changes to show a tiny preview video display. It shows record duration in red letters so you don’t accidentally leave it running. Hit the record button again to make it stop. All GPS processes keep going and are unaffected by the recording camera. There’s an auto record mode that you can program to trigger according to heart rate, ascent gradient, descent gradient, speed, cadence, power, time, or distance values. Auto record is limited with pre-set record times of 3, 6, 9, 15, and 30 seconds. Auto mode can let you capture interesting moments whether a particularly quick ascent, dropping a major wattbomb, or hitting a grotesquely high gradient. One could conceivably stitch together a fun highlights package from a crit based on snippets of footage from when they exceeded a certain power. So how’s the footage? Well first you need to set your expectations. This isn’t, and was never going to be, a GoPro replacement. The camera has 1280x720 resolution, lacks of stabilisation, and is limited to 30 frames per second. Before you judge those numbers too harshly; remember that this is a camera inside a cycling GPS. Higher camera specs would mean greater expense, more processing power, bigger battery, and more weight. Footage is on a spectrum from decent to unwatchable. It’s perfectly usable when used on a rigid mount, on a smooth-ish road, and with good light conditions. The best setup I found was my Curve Belgie Spirit with its rigid metal Tune Porteur mount bolted directly to the stem. Even the coarse and bumpy street I filmed on was smooth, although the unit struggled with the golden hour light levels. On a regular Garmin mount and stiff road bike the footage is decent so long as the surface isn’t too rough. On a stiff road bike with the soft Xplova mount riding gravel it was dramatic. That footage is only useful for comedic purposes. Check out the sample videos below to see what I mean. Bear in mind with the clips below that there’s some loss of quality with YouTube compression. So, answering how good the footage is depends entirely on context; bike, road, mount, and light conditions can all impact the final product. I want to stress how damn cool it is that a cycling GPS has a pretty functional camera in it. The Xplova X5 Evo has shown me that there’s most certainly a future for this tech. Xplova’s platform goes beyond hardware for filming, and gives a tidy smart phone app. Its called Xplova Video and you download it in addition to the regular Xplova app. Once installed, the app communicates with the Xplova where you can flick through captured video files on the device and transfer them to your phone. This is where the WiFi hotspot tethering makes sense because it transfers the files quickly. The app then allows some basic editing with clip trimming, adding data overlays for speed, heart rate, power, and cadence, and even adding music. There’s some generic music from Xplova, plus the option to choose from files on your phone. It’s intuitive enough for most people to pick up without too much difficulty. Editing is a cinch with the basic Xplova Video app. The app will then export your video project for uploading but there’s a 5 minute limit so don’t expect to upload an entire mountain climb. My Pixel 2 XL exported videos speedily, a positive aspect of the 720p res. Footage of this resolution doesn’t suit large screens but it looks fine maximised on my full phone screen. Uploading directly to social media platforms is the obvious choice here. Perhaps we’re not far off Strava allowing short video uploads added to rides like they do with photos. You could use the files for YouTube but they don’t pass muster on large computer screens or TVs. It’s laudable that Xplova’s platform makes file transferring, editing, and exporting this easy. Uploading once your ride’s finished is easy. You can sync with your device through the Xplova app, or plug it into a computer and direct upload in a browser. It’ll share the ride with Strava, TrainingPeaks, and XingZhe (whatever that is) if you’ve connected those services. You can take a gander at basic ride data through the app, with more data options available in-browser. As with all platforms from GPS makers, some users might get value from them but most people’s use of Strava, TrainingPeaks, and Garmin Connect make them unnecessary. Still, it works just fine to visualise your ride data. How do you begin to wrap up a unit like the Xplova X5 Evo. It’s either pretty great, just fine, or needing work depending on what feature you mean. It’s at the pointy end of the market at $599. That’s Garmin Edge 820 money, or two Lezyne Mega XLs for a different perspective. The X5 Evo does a lot of things well enough to earn its spot in the conversation. To me, expected use of the camera is the most important factor if you’re thinking about whether to buy the Xplova X5 Evo. It’s still a good unit if you never use the camera, but it diminishes the overall value of the unit compared to its competition. The camera. I’m a believer in the concept if not this exact execution. All that processing power makes the unit excellent to use. Xplova nailed the touch screen. Maps are great, and free. Slick phone apps make video transfer and editing easy. Navigation is fine. It’s a subtle system that requires vigilance. Battery life is fine, but borderline too short. Chunky buttons spaced well apart means you don’t press the wrong thing. Menu navigation and interface is decent. Xplova mount isn’t rigid enough. Camera is very vulnerable to road and light conditions. I feel like it needs another generation of development to mature. The Dashboards are cool but being unable to change them isn’t. There’s no Strava live segment tracking which is an expected feature nowadays. It’s not a pretty unit.